Embrace the fresh Yorkshire air and time together in this magical setting. 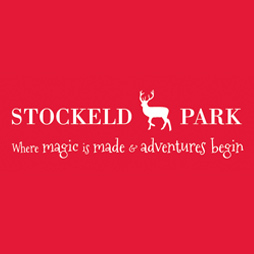 Stockeld Park opens its beautiful parkland throughout the school holidays with fun for all the family including February, Easter, Spring, Summer, Halloween and Christmas events. Take a walk in the Enchanted Forest and let the children (and adults!) burn off some energy in the Adventure Playgrounds. Whizz around the forest on Electric Scooters! Get lost in the big Yew Tree Maze or try out your skills on the ice/roller skating rink – now under cover so you can get your skates on whatever the weather! (Ice/Roller – season dependant). There is Interactive Play, a huge Yew-Tree Maze and a Woodland Laser Tag arena too! Stockeld Park, off the A661 Wetherby Road, LS22 4AN. Tel 01937 586333. For more information visit their website here or their facebook page here. 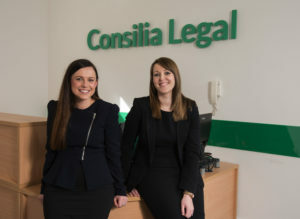 Consilia Legal are experts in all areas of family law, including divorce, separation and matters involving children. With a team of expert family solicitors dedicated to achieving the best outcomes for clients and an emphasis to find pragmatic and cost effective solutions which best suit your needs. This highly regarded family team have an excellent reputation in the Yorkshire region and can represent you wherever you are located. Family solicitors Sarah Manning and Laura Clapton are also qualified family mediators and offer separated couples the opportunity to work together to resolve the practical and legal steps necessary to achieve a separation that is fair for the whole family. Where appropriate children can also be involved in the mediation process so their views can be heard. They are offering Mumbler’s a FREE initial consultation on family matters and then a 10% fee reduction. Diggerland – The Ultimate Adventure Park Experience! Diggerland is the perfect place to take your kids for an action packed family day out. Experience the variety of rides and drives on offer – whether it’s enjoying the view on Skyshuttle, hanging tight on Spindizzy, or digging dirt with a 6 ton digger, there is something for all ages! Admission to Diggerland includes all day access to as many rides and drives as you dare. Admission charges start for anyone 90 cm’s and taller, but visitors should be aware that height restrictions apply. Minimal charges apply for the coin-operated rides. Little visitors under 90cm’s are limited on the amount of mechanical activities they can go on, even accompanied by an adult. 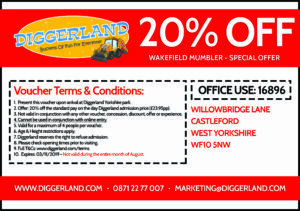 All you have to do is download the 20% off Diggerland voucher (click here) and present it on arrival at the Diggerland Yorkshire Park – WF10 5NW. Mumbler has teamed up with Stray FM to promote exciting new offers for local families. Get an exclusive additional 10% discount on the Stray FM vouchers with our discount code Mumbler10. Click here to view the latest offers. Escape to a luxury cabin with private hot tub with Forest Holidays and enjoy 5% discount – the perfect getaway for families, couples and friends. Choose from 10 locations across the UK, including 2 on the edge of the North York Moors National Park on stunning Forestry Commission land. You can pack your days with action and adventure, hiring bikes or trying your hand at canoeing, archery or a range of other pre-bookable activities. Or perhaps you prefer to luxuriate with a glass of champagne in your own private hot tub under a starlit sky, soaking up the serenity of the forest around you or enjoying a soothing in-cabin spa treatment. The freedom, the fresh air and the forest are yours to enjoy at your own pace, whatever the season. And our pet friendly cabins mean you can bring your dog too! Book now with code MUMBLER19* and enjoy a year-round 5% discount using promo. Don’t delay, visit www.forestholidays.co.uk or call 03330 110495 and quote the code. *Discount can be taken at any time of the year including school holidays and Bank holidays, and applies to all cabin types. This discount applies to the cabin price only and not any extras. May not be used in conjunction with any offer and cannot be applied retrospectively. Forest Holidays reserves the right to withdraw this offer at any time. For more information, please read the blog here. If you and your children love ‘yummy’ breakfasts’ then visit Crag House Farm Granary Restaurant (term time only). Order your breakfast worth £5 or more before 11am Monday to Friday and up to 2 children get theirs absolutely FREE! You can enjoy a coffee whilst children play in the ‘kids corner’ with toys and books. After breakfast enjoy some fresh air and fun in the new children’s outdoor play area. Terms & Conditions – preschool children only, term time only, children order from children’s menu, maximum 2 children per paying adult. Daddies, grandparents and carers are welcome to use this offer too! Crag House Farm, Otley Old Road, Leeds. Tel: 0113 230 3618. Mother & baby skincare products developed by two local mums. Winners of several awards including a Gold Mother & Baby award 2017. Visit www.loveboo.com and enter the code MUM15 at the checkout to claim your special 15% Mumbler discount.